Andrew Scott is the author of Shifting Stories – How changing their stories can transform people. I asked him recently about his book. When you use the word ‘story’ you seem to be referring to the way we think about ourselves, others, and situations or events. How does this work? The stories we tell ourselves (all the time and almost unconsciously) have a major effect on our thinking and behavior. Perhaps the simplest way to understand this is to try an experiment. Think about a time when you have been absolutely in top form. Everything has been going well; you have been working efficiently with grace and confidence. Consider the story you were telling yourself about yourself at that time. Now, put that to one side for a minute, and think about a time when you felt devoid of confidence when everything was going wrong, and people were misunderstanding and undervaluing you. Consider the story you were telling yourself about yourself at that time. One of my favorites is “One day they’ll find out”. Finally, consider how different a day is likely to be if you spend the day engaged with the positive story, compared to if you spend the day engaged with the negative story. The way you think about issues and people will be different, the way you interact with people will be different, and the resulting outcomes will be different. Each will tend to reinforce the story you are engaged with. These two stories, the positive and the negative, both have some truth in them: they come from somewhere and are based on our experiences. But they are also made up by us: we construct stories by interpreting our experiences in particular ways and attributing meaning to them: and we do this all of the time, without noticing it. And then confirmation bias, which is that tendency we all share to see and give weight to things that confirm what we already think, strengthens these stories so that they seem like reality. In your book, you talk about a Many Story Approach. What is that? The Many Story Approach assumes that we all have many stories available to us about any situation. 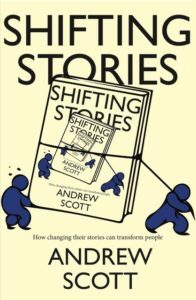 It offers a way of helping other people to notice any unhelpful stories that are dominating a part of their life (say a working relationship) and then helping them to replace them with more helpful stories. Naming a story does many things: it helps us to refer to the story briefly, summarizing a potentially complex set of experiences and interpretations. Naming a story also helps us to treat it as a story, rather than as a reality. Naming it also helps to open up distance between ourselves and the story, so that we can see it is not intrinsic to our identity. Often, the name also reveals a degree of exaggeration, for example, the catastrophe implicit in my “One day they’ll find out” story. That may help us to see that the story has taken on a life of its own, beyond the bounds of plausibility. Where do we start if we want to help someone (or ourselves) resist becoming attached to negative stories? There are three phases in the process to help somebody to replace an unhelpful story. The first is to loosen the grip of the story. Stories are tenacious, and if we have lived with them for a while, they seem like reality. So attacking them is often counter-productive. We need to discover more gentle ways to loosen their grip, or the person we are helping may hold on to them all the more tightly. The second phase is to discover more helpful stories. The key word there is ‘discover.’ It is not a matter of making up fantasies or indulging in wishful thinking, but going through a rigorous process to find new and more positive understandings and insights. As before, naming the story can be very helpful here. The third phase is to thicken the plot of these more helpful stories so that they have more hold on the mind and imagination of the person we are helping. Old stories die hard, so this is an important part of the process. Sounds like this might take a bit of practice! Where can readers find out more? That has been one of the biggest learnings for me this year! Your post is a great summary and I can’t wait to order the book. This quote reminds me to observe the story and also to examine the evidence that I am collecting to make my story right. Thanks for your comment Deb! Interestingly, I think there are a lot of people out there who share your view! So many of us are being ‘strongly invited’ to consider that ours is not the only perspective. Moreover, how we view ourselves may not even be as accurate as we are convinced it is. Hmmm.